Pandya Computers, Inc. provides a wide range of high quality computer and related professional services to the government, education, and private sectors. 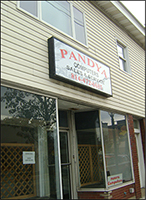 Pandya Computers, Inc.'s core expertise is in networking, computer repair and maintenance, programming and software development, and e-commerce. 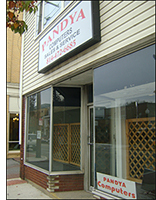 Headquartered in Ebensburg, close to the intersection of two major highways in west-central Pennsylvania, Pandya Computers, Inc. is easy to access and has clients throughout Pennsylvania and the mid-Atlantic region. At Pandya, our goal is to improve the world one computer at a time. Whether it's making a repair to the family laptop, or setting up a networking system of thousands of computers, Pandya strives to serve the needs of our customers first. Recognizing the importance of community from the start, the company has also been active in community support and has helped many community programs, educational events, and social institutions. For the past 30 years, fast, friendly, reliable, and high quality service and innovation have set Pandya Computers, Inc. apart from other computer companies. Our record of service is near perfect. Whether it is service contracts with the Commonwealth of Pennsylvania, with Dell Computers, or service to our thousands of local customers, Pandya Computers, Inc. always strives for perfection and customer satisfaction. In 2002, Pandya Computers, Inc. began providing document management and computer maintenance services to the United States Patent and Trademark Office. Pandya provided the USPTO facility with the flexibility and convenience of having a full time, on-site IT staff, while having access to our expert staff in Ebensburg for complex technical issues. This provided the highest level of service and allowed the USPTO to enjoy tremendous savings in administrative costs. Pandya Computers, Inc. has experience in web site development, online data base management, and information collection and dissemination. Over the years, Pandya has helped more than 500 businesses and organizations, several colleges and universities, and dozens of public and private schools set up computer labs, administrative office computers and networks, and campus-wide networks. Our network setup and network cabling experience ranges from two-computer networks to 250-computer networks. This proves that our skilled technicians not only have the tools to succeed during office repair, but also out in the field. In short, Pandya Computers, Inc. has extensive capabilities and experience in all phases of computer design, implementation, and management, including capacity planning and document management. 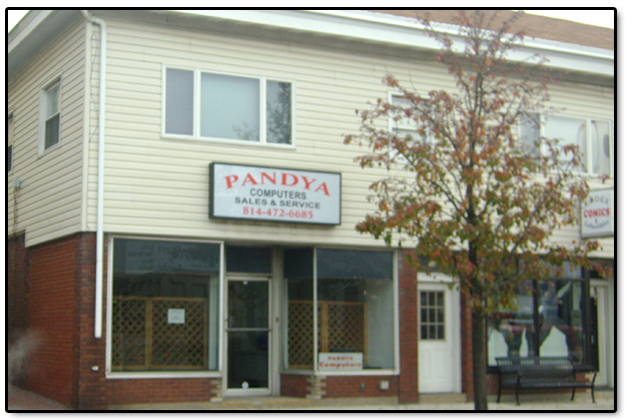 Pandya Computers, Inc. has its roots in computer assembly and have been successful for over three decades. We were the first company in the area to assemble high quality IBM-compatible computers on a large scale and continue to strive to reach new heights with every project we complete. Backed by a solid management team and supported by a highly skilled technical staff, Pandya Computers, Inc., as an information technology solutions company, provides a full range of services across many enterprises. We are prepared to help our customers by any means possible and will back up the tasks we complete with our extensive knowledge gained over through years of experience.